These Leitz WOW A4 Folders feature a stylish two-tone design in bright, striking colours and are ideal for use with A4 paper and filing systems. Made from extremely durable polypropylene and featuring a grip area for easy access to documents, these folders hold up to 40 sheets of A4 paper and ensure the contents are secure and protected. 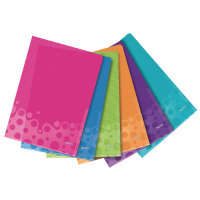 This pack contains 6 folders in assorted colours of pink, blue, green, orange, purple, and ice blue.